Very nice fabric, smooth and soft. Birds look a little weird, but the overall design is very nice. Works well with our mustard/teal color combo. 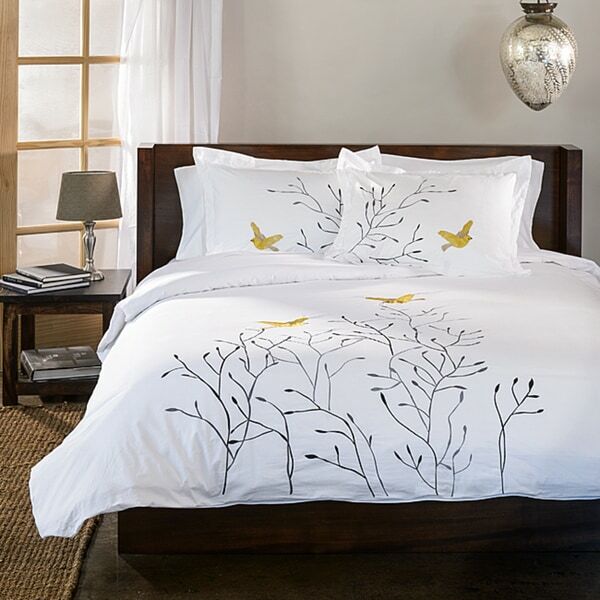 Add a touch of elegant style to your bedroom with the Superior Swallow 3-piece Embroidered Cotton Duvet Cover Set. This set features a soft cotton construction in white with an eye-catching embroidered tree motif and colorful birds that you will be sure to love. I am very pleased with the duvet set. The embroidery is awesome and lends to the quality of the product. It is good to remember that your comforter shoudl be white to not be seen through. Mine is an off white and makes the duvet look not quite as bright. But it is beautiful and exactly what I wanted. It will go with any decor, so is a super versatile piece! LOVE IT! Pretty piece with really nice embroidered (not printed) birds and branches. Cotton cover is a little thin. If you put a comforter inside that is not white, it will ghost through. A little rumpled coming out of the dryer and the embroidery shrunk just a bit and puckered the coverlet very slightly. Size seems to run small for a queen size bed. Probably have 6 or 8 inches of drop on the sides - not enough for most mattresses. I have to pull it over to the side that shows and let the other side ride high. Pretty piece could be great if the size was a little more generous. Now embroidery is judged by the density of the stitching. It needs to cover the underlying material completely. Only quality pieces are like this. This piece is really nice clear cut lines an colors great Quality vivid colors nice cover all in all excellent over all quality an exceptional price. This is so bright an pretty brighten up the whole room. I got the red it is not so much that you can not use many other colors base material is also great quality. I really like this duvet cover. It's a crisp white cotton fabric with a very pretty embroidered pattern. The duvet cover has held up well so far after being shared with my dogs and cat and washed. The price was also really good, especially considering the good quality and appearance of this duvet cover. I'm writing this review as I put on my duvet cover. It arrived weeks ago but I'm just opening it now. First off the embroidery is very nicely done, the sparrows however are more gold/green then yellow as pictured. If you're looking for yellow keep shopping. That aside the quality of the fabric is poor. It's like covering the duvet with a thin sheet, sheets I would never buy to sleep on. You must have a white duvet or anything else with show through as others have mentioned. It also is very large, I bought the king for king duvet but my duvet swims inside it. I put it in the dryer to get the wrinkles out, maybe it will (probably) shrink when I wash it.. but then the embroidery will probably bunch up. I'm only keeping this because I have nothing else, otherwise I would return it. It's not worth the $* total I paid. LOVED THIS DUVET COVER!!! It is both beautiful and soft. Great duvet cover. The print on the cover is beautiful. It has a texture to it. Love the color. Good quality. Great quality product for the price. Embroidered duvet looks great and displays nice, crisp colors. Looks great and would highly recommend. Very nice duvet cover. I love it. I wanted a plain white duvet cover and then I seen this one and changed my mine. There is just enough design and the stitching is beautiful.It has held up after one washing still looking good. I would purchase again Many compliments. Love the design---the fact that it has buttons for closure rather than snaps. It was also a lot easier to put on than our previous one from IKEA. I would struggle with the old one but this one goes on much easier. It's also beautiful. The only thing was that it was quite toxically smelly (like industrial plastic) when I opened it. I suppose washing is a good idea anyhow, but this really has to be washed or you'll be sleeping in a toxic zone. I like this pattern and I'm keeping it, but the white cotton is very thin and ultra sheer. The down comforter pattern underneath shows through and it doesn't lay smoothly because it is so thin. Love this set! Beautiful! Very high quality! Loved this duvet set! Very good quality even after being washed several times! Though it's prone to wrinkling, this is a comfortable and lovely duvet cover. The material is soft, even more so after a few washes, and the stitching on the design has held up well. Overall, very good piece. Love this duvet cover that goes folded at the foot of our bed, over the new "sanctuary" yellow-gold/gray quilt I also recently purchased on Overstock. They look great together, very happy and springlike! It was a great Duvet cover till I changed it. Just as depicted by the photos! This is a beautiful duvet cover. Washes nicely but has to be ironed. Very nice piece. Has lasted a long time. Looks beautiful. I purchased this for our spare bedroom, I was very impressed with the details of the embroidery on the front and the pillow cases. Very nice quality and love that this had buttons at the bottom instead of a zipper. You can’t go wrong with this purchase. Love the simple natural look. I bought it to go with the Safavieh Handmade Soho Twigs Light Blue New Zealand Wool Rug that is in my guest room. It is beautiful and best of all it is washable and dries quickly. My only complaint is that I wish it were made of a thicker fabric, greater thread count. If my windows weren't so unusual, I'd buy another to make curtains. "Do you need a dust ruffle with a cal king?" "Does one need a dust ruffle with this duvet?" "Are there internal ties to secure the duvet?" No there aren't, but it is very nice! 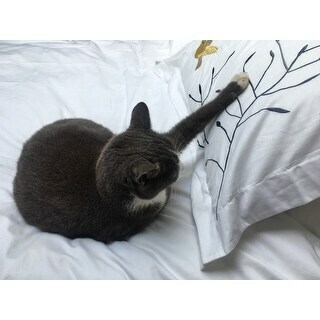 "Is this 100% cotton? what thread count?" This duvet cover is 100% cotton and has a 200 thread count. "Is the King Size and the California King the same size dimensions?" "Hi, Some of the birds look yellow with grey branches. Is there a yellow option? Thanks!" The gold option is currently out of stock. We restock items as they become available; however, we cannot guarantee an item will be restocked. "hi I want this product but I want the one with the blue birds and there is no way to select that color. I went to my cart and it has the one with the yellow birds"
At the time of this posting, the blue option is out of stock. Items are restocked as they become available, however we cannot guarantee a specific option will return.